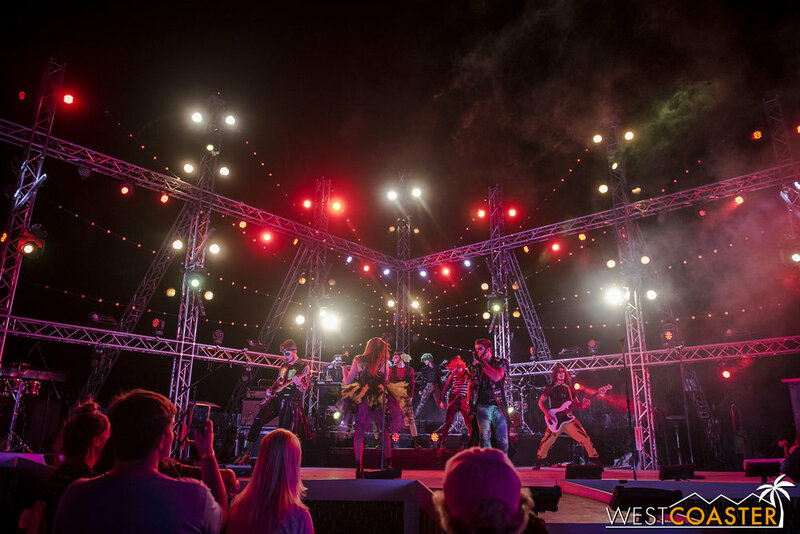 We’re taking you on a bit of a journey this week at Westcoaster. On Monday, we kicked off our Halloween haunting season with a stop at Universal Studios Hollywood to check out their Halloween Horror Nights. Yesterday, we teleported over to a haunted ship… to see some magic. And today, we’re at a Magic Mountain… to explore some haunted houses. 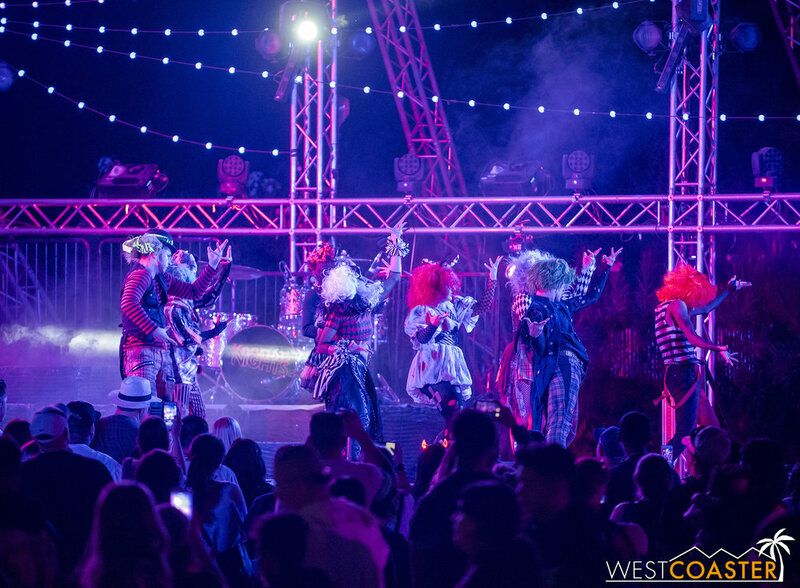 Yes, Fright Fest is upon us, and for the next six weekends, Six Flags Magic Mountain will be teeming with ghouls and monsters and deranged lunatics (that’s not a euphemism for the guests)! 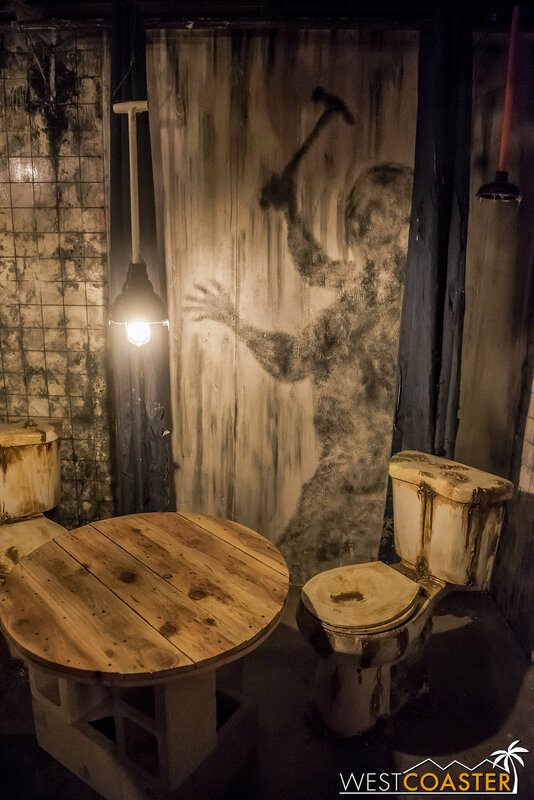 When this new maze was announced a couple of months ago at Midsummer Scream, there were jokes-a-plenty accompanying the news—all belonging to the toilet humor section. “If it’s not your favorite, it’s definitely number two,” was the immediate zinger off the bat. 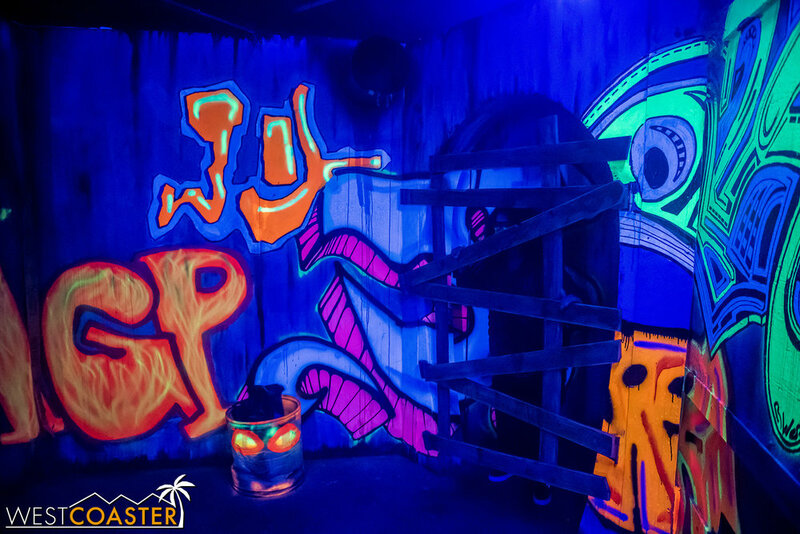 And with the location being up on Exile Hill, in the spot formerly occupied by the thoroughly lackluster Willoughby’s Garden of Darkness and last year’s underperforming Dead End mazes, the predictions of another “crappy” maze were quick to come. Add to the consideration that this was Magic Mountain, a park that has certainly had operational issues and problems with service quality in the past, and there was plenty of reason to have low expectations coming into this maze. 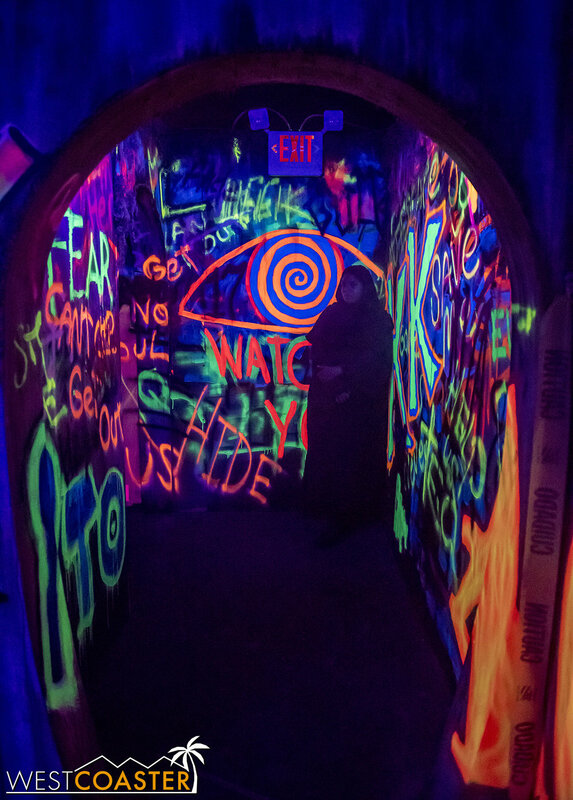 Sewer of Souls is a 3D maze, and with the provided glasses, the colors in many of the rooms really pop. Well, things sometimes happen when you assume, and in this case, Sewer of Souls ended up being anything but a stinker. In fact, it was easily the best maze of the night, eclipsing the other two mazes (more on those later on) and the three returning haunted houses at Fright Fest! 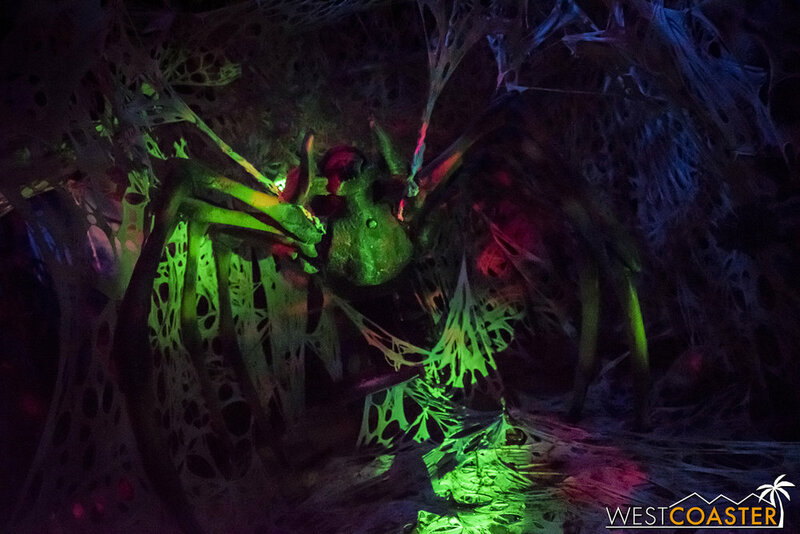 Yes, the maze literally was themed to a trip through the dirty muck and disgusting trail of an underground sewer, but it was beautifully themed, creative and varied in its scares, and innovatively laid out. 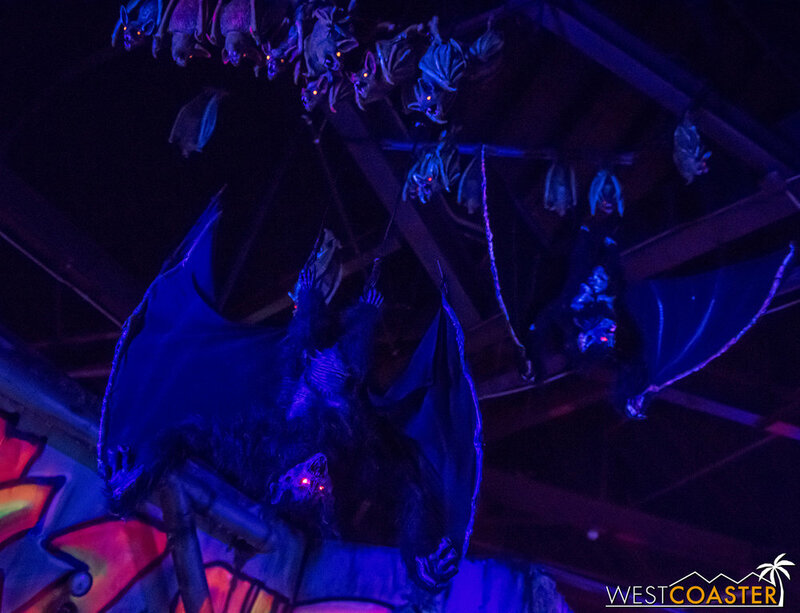 It was a 3D maze as well, and with unique scenic designs and elements never before done at Fright Fest, plus colorful rooms that took advantage of the Chroma Depth 3D painting techniques to make visuals really pop, Sewer of Souls was a joy to experience—and plenty of fun as well! Scenically, this maze is very photogenic. Six Flags wisely chose not to hit the nail too hard on the head by flooding the maze with foul odors, which I really appreciate. 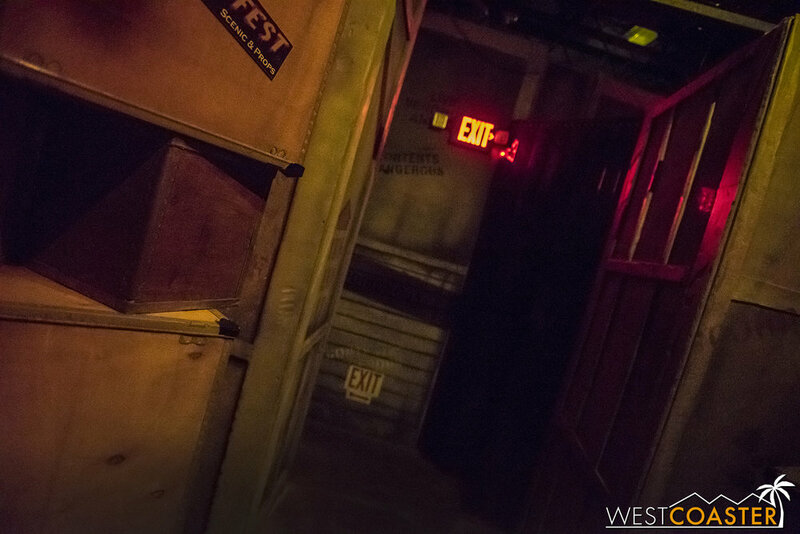 But from a technical perspective, this represents one of the most advanced mazes ever featured at Fright Fest, perhaps eclipsed only by the scale and epic scope of Aftermath 2. 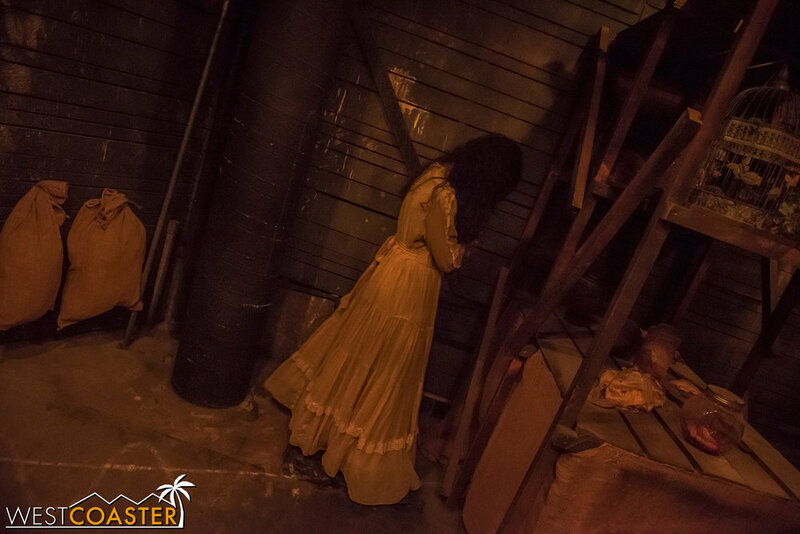 But at Sewer of Souls, there are traditional jump scares by actors, plus puppetry effects, statue scares, and distraction scares. The maze also creates discomfort by forcing guests to duck and alter their center of gravity in certain elements, and there’s even a nifty moment where guests may actually be turned around! Projections also make a couple of appearances, creating some pretty great effects, especially when viewed through the 3D glasses. The secret entrance is kind of crappy and available for V.I.P. guests. There’s also a secret room that only V.I.P. guests can access through a hidden (not really that hidden) entrance. It’s really more of a V.I.Poo room, if we’re being honest. Inside, guests can have a special photo dump—I mean op—before joining the regular line at the beginning of the maze. It’s a small touch, and admittedly kind of absurd, but it’s the type of extra detail that is helping Fright Fest slowly shed its traditional label of being a second tier haunt so that it can compete with the big boys on the block like Knott’s and Universal. 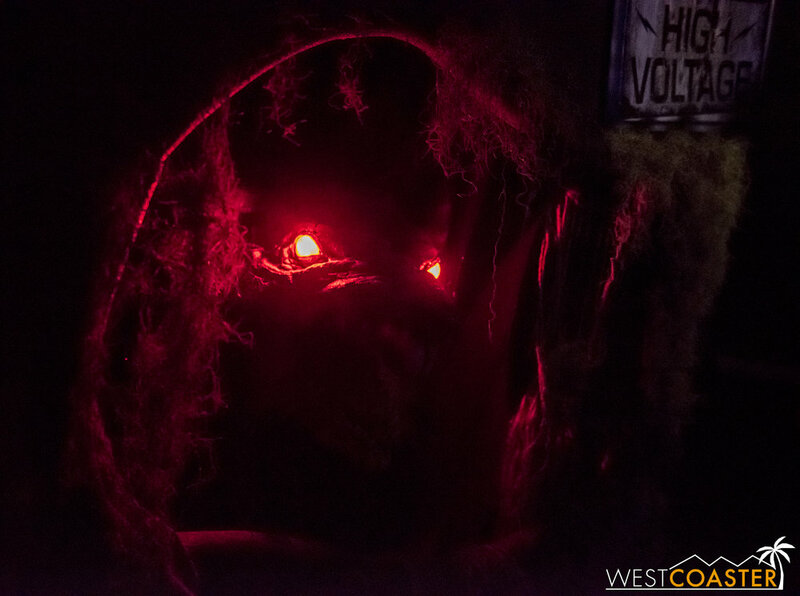 This year, our second favorite maze of Fright Fest ended up being the now-veteran Red’s Revenge, located in the cluster of three mazes at the front of the park, just to the right of the park entrance plaza. This maze tells an alternate timeline for the classic Little Red Riding Hood fairy tale. In it, Red is torn limb from limb by the big, hungry wolf, and her spirit comes back from the afterlife full of rage and vengeance against the villagers she blames for not protecting her. The result is a maze that has a “fable-gone-wrong” feel to it. Mysterious and haunting creatures lurk in the woods to grandmother’s house. Things get a little webby as guests descend further. 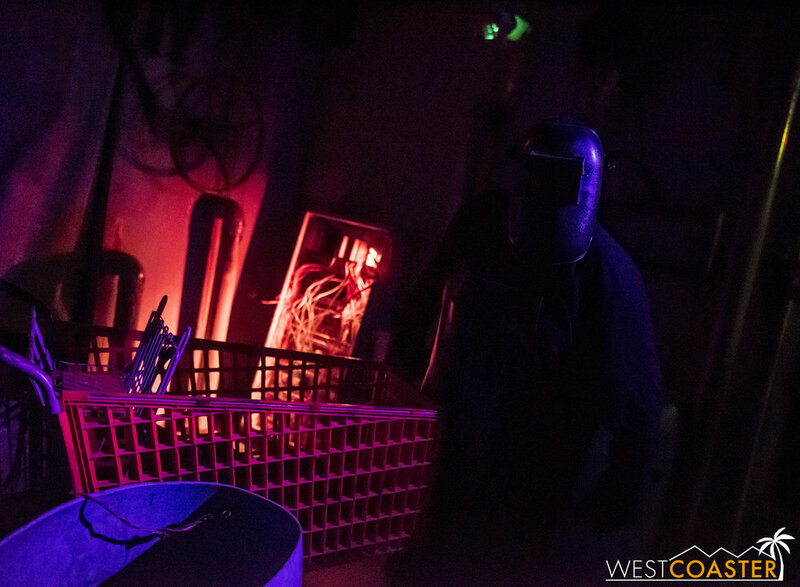 Red’s Revenge was the first of a new generation of Fright Fest mazes that have sought to elevate the quality at the event and compete with the increasingly more sophisticated haunted attractions out there. 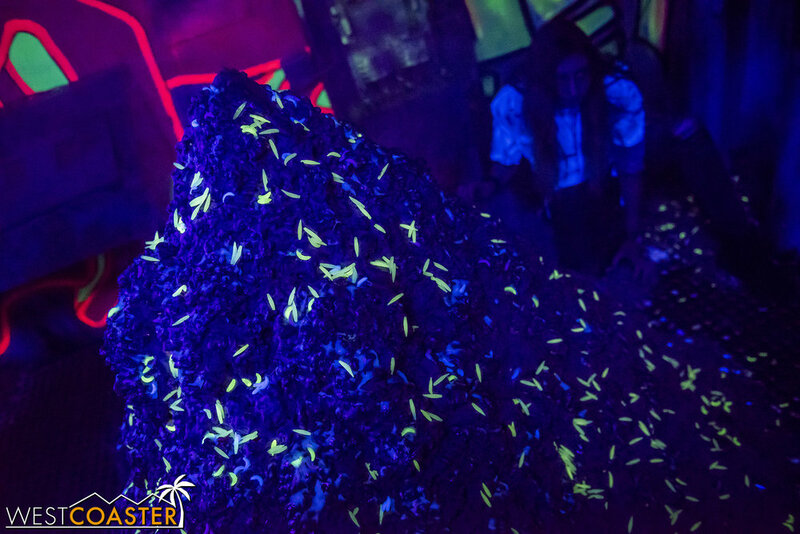 It’s always been a solid maze, and this year was no exception. The theming and set are the same as previous years (at Magic Mountain, the mazes by and large stay up all year long), but the monster actors were energetic and well paced, nailing their scares with consistent timing that felt more midseason form than opening weekend. Kudos to the crew for that effort! Red is back, and she will have her revenge! Over by Apocalypse: The Ride, Aftermath 2 tells the story of a mysterious and dangerous infection that is rapidly spreading through the town of Ash Valley. Now, why people would want to live in a community called Ash Valley is beyond me. Seems like that sort of name just has bad news written all over it—or at least breathing problems. Nevertheless, this illness seems to be turning residents into flesh-hungry, undead beasts. 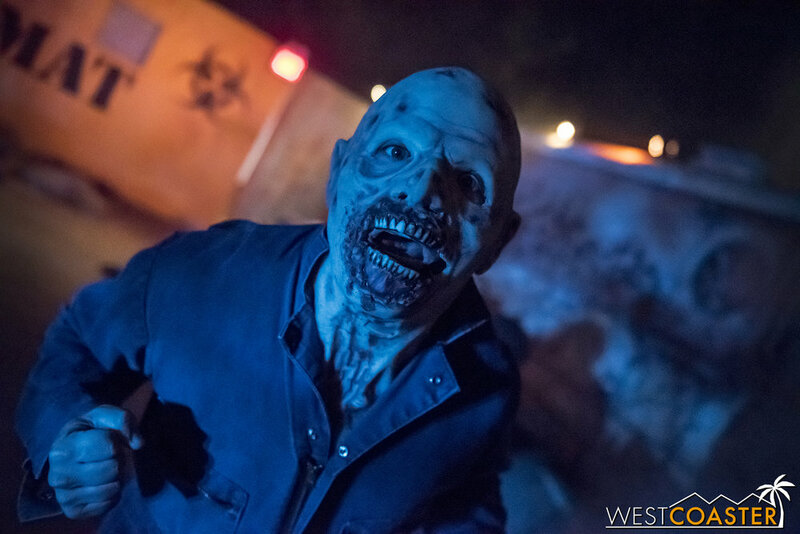 Guests trying to evacuate the town must navigate a sprawling layout (Fright Fest’s largest maze ever—by a long shot) to escape. Fire is great in any themed attraction. 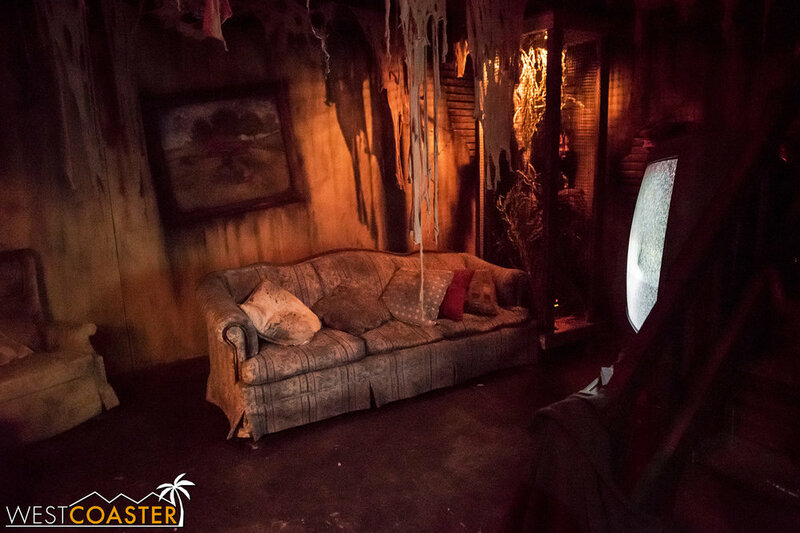 Aftermath 2 has been our favorite maze at Fright Fest two years in a row, but this year, it fell to third (closely behind Red’s Revenge) on account of what felt like lighter casting than prior years and a slight diminishment in the visual spectacle of the maze. Make no mistake about it—this is still a great maze, especially for any guests who have never been through it before. But the energy did not seem quite as high as in previous years. This could be chalked up to opening weekend syndrome, since it takes time to get into a rhythm, or it could have even been luck of the draw with break schedules coinciding with the time that we walked through. But the net effect was just a little less spell-binding than in previous years. Ash Valley has definitely seen better days. 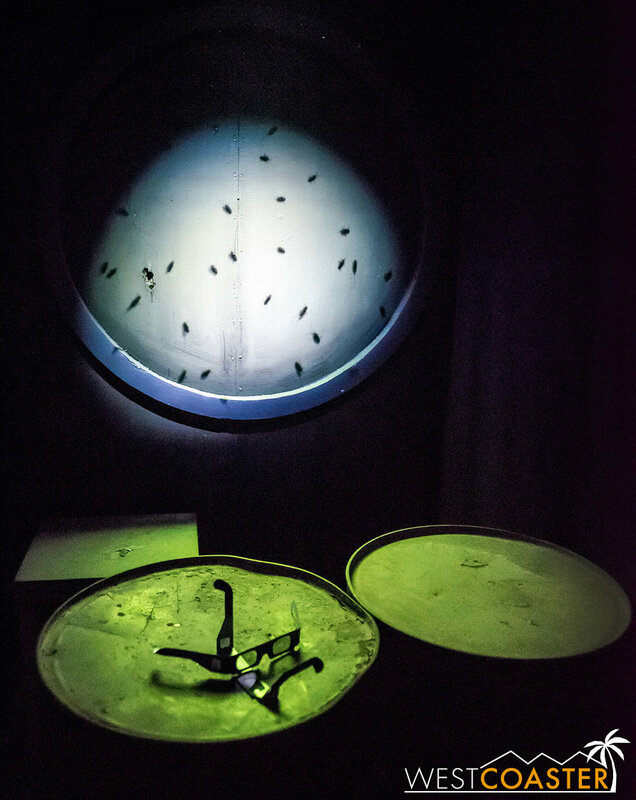 What is it about mysterious viruses and a penchant for flesh eating? Still, given the line-up, this was still in our upper tier of favorite and best mazes. The other maze on Exile Hill (aka Samurai Summit) has been around for a lonnnnnnng time. The original Willoughby’s maze debuted in the mid 2000s, and the current version has been around since the beginning of this decade. Still, Willoughby’s continues to be a strong maze on account of its actors, who throw plenty of intensity and vigor into their performances. The front of the old Willoughby’s estate. 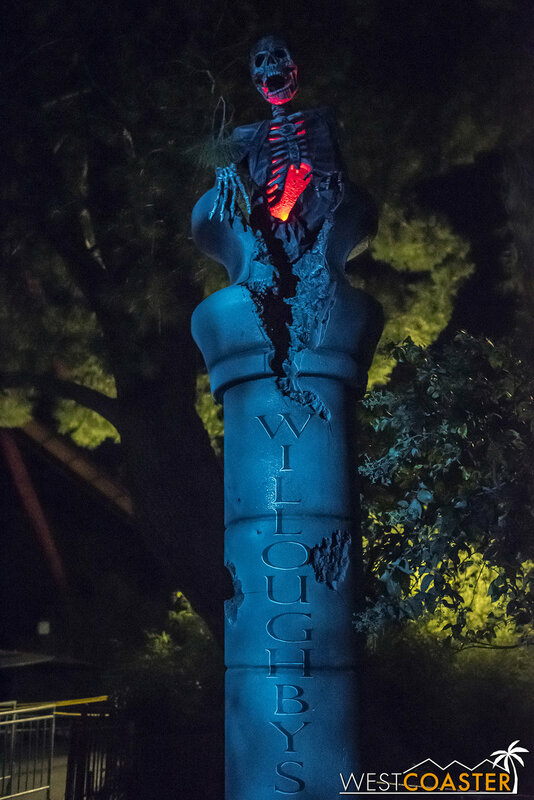 The Willoughby’s legend plays a central part of Fright Fest lore. Long residents of Exile Hill, the family was once a powerful and wealthy clan, but unspeakable evil led to its downfall, and its members now haunt the grounds, both inside and out. The house is gloomy and moody throughout. The last couple of rooms are the only really light rooms out there, and they pack a great finale punch! The maze remains the same as in previous years, and I still think that it could really benefit from a lighting upgrade to illuminate some of the scenes a little better. 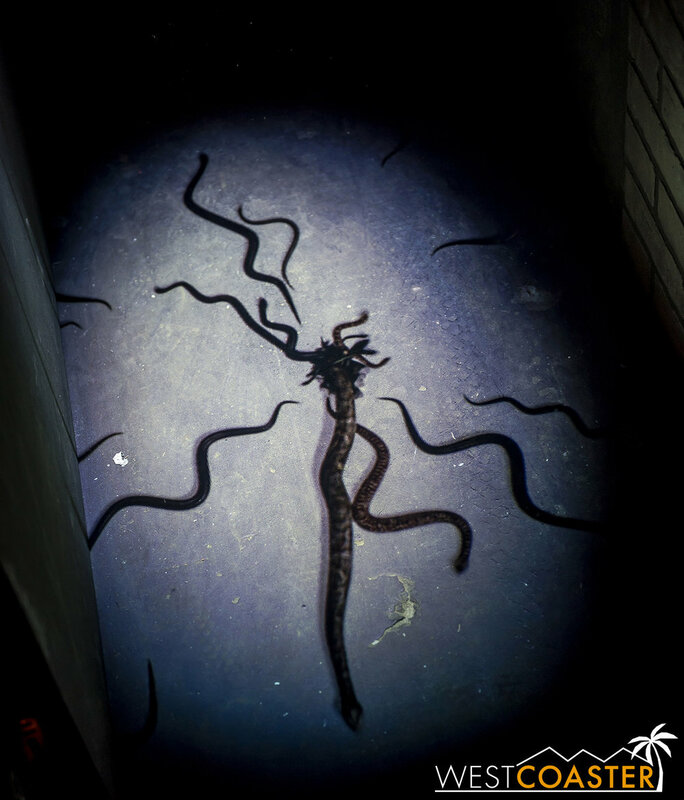 But part of the apprehension of this maze does come from its dark and twisted corridors and dim lighting, making it difficult to gain a grasp of what’s coming. It’s a solid tier below the previous three, but I personally still find myself enjoying my trip through this decrepit Victorian mansion every time I go through. 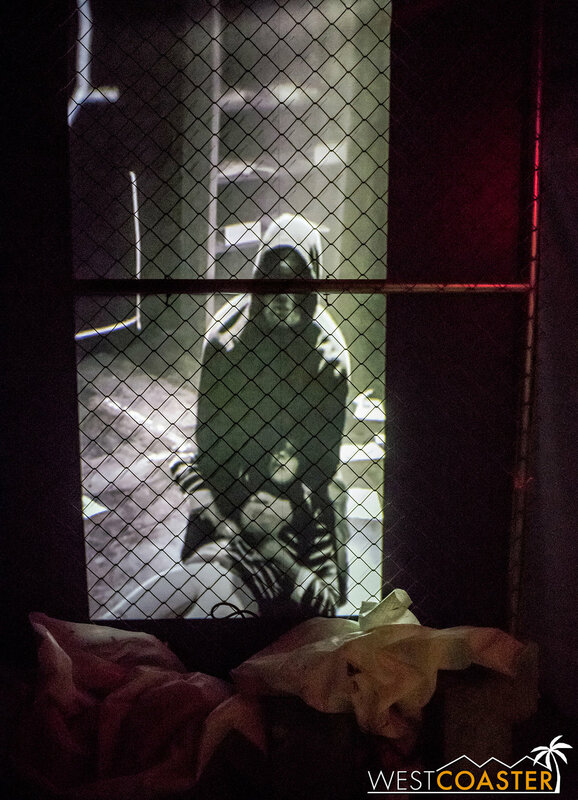 Condemned is the second of the three new mazes featured at Fright Fest this year. 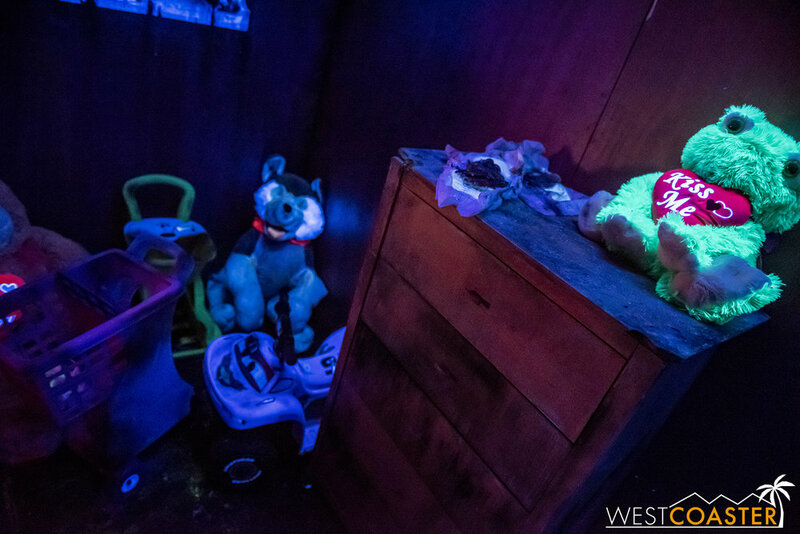 Located in the home of last year’s Toys in Terror 3D, this maze features the home of a collector of “curious things.” Whether “condemned” refers to the legal status of the house itself (it certainly looks like it’s falling apart) or the inhabitants within is unclear, but the theme seems to be a general encompassing haunted house of cursed souls. Interior scenes are gritty and literally take guests through various rooms of a ramshackle resident. And the inhabitants inside certainly have their fair share of plights. The interior of the house, full of less-than-welcoming inhabitants. Truthfully and especially in comparison to Sewer of Souls (which we went through after Condemned), this maze was a little disappointing. Although the scenic design and ambiance of the spaces was fine, the very dim illumination and relative lack of pointed theatrical lighting did a disservice to maze, denying a chance to appreciated said features. Also glaringly apparent was the relative silence throughout the maze—no soundtrack or even soundscape present to provide atmospheric mood. This kitchen is decidedly gross. There were interesting moments. The path had localized divergences in a couple of spots, forcing guests to duck down or push through a dense closet or sidewind their way through claustrophobic spaces (a wider, ADA-friendly alternate and parallel route is available at these areas for the disabled), which definitely made things uncomfortable. But the overall lack of a cohesive story and standout moments made this maze fall unfortunately to the bottom of our rankings, despite its being new for 2018. If Condemned was slightly disappointing, however, Hell Fest was the most disappointing maze of the night. In fact, it was a sort of roller coaster of emotions. 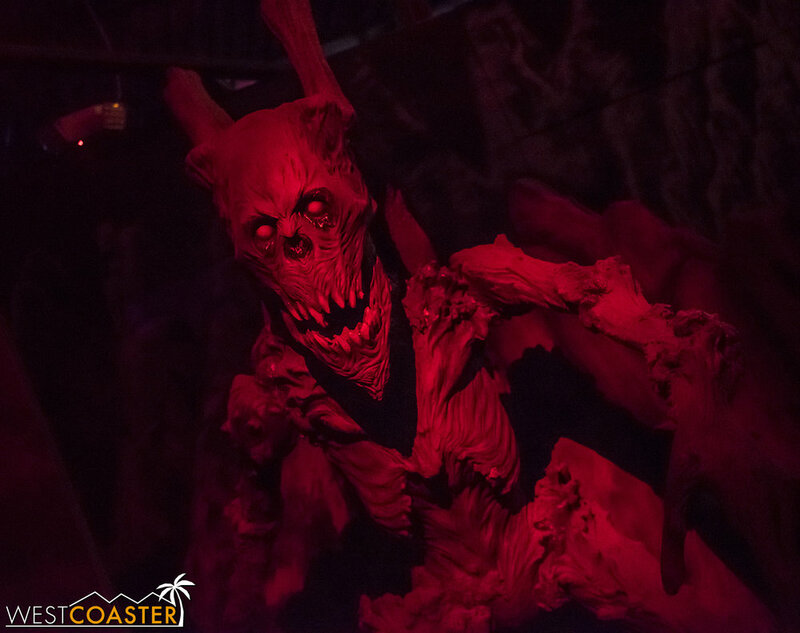 During Midsummer Scream, Sewer of Souls and Condemned had been announced as the new mazes for the year. There was no reason to believe that Magic Mountain would add a third, which would be out of the ordinary. And yet, quietly sometime last month, Hell Fest was added to the line-up—a product of cross promotion with the upcoming CBS Films movie of the same name. Another new maze? Pretty cool! The beginning several rooms of Hell Fest appear extremely similar to Vault 666, with different lighting as the only distinguisher. For tie-in maze, however, Hell Fest does not really do a adequate job explaining what it is about. I had not heard of the movie prior to learning about the maze, and I had to ask a friend what the movie was about before I entered. For the record, the premise is sort of intriguing… it revolves a traveling haunted amusement park that bore witness to a murder of a guest a few years prior. Now, the murderer has returned, and he begins picking off guests one by one—benefitting from other guests’ thinking that the dead bodies are all part of the show. This room was kind of cool and creepy. The theming does pick up in the second half, with more rooms better tying to the movie. Hell Fest is also located in the trio of mazes next to the park entrance, diagonally across from Condemned, where Vault 666 stood last year. But unfortunately, there are more similarities than location. The interior layout is effectively the exact same as Vault 666, and only a third or maybe half of the maze has received any new theming elements. To a new guest (or someone who hasn’t been to Fright Fest in five years), this may not matter, as everything is new. But to a returning guest who has experienced Vault 666 before and is expecting a new maze, Hell Fest is disappointing. It’s only half of a new maze at most, and its most memorable scenes really occur within the exact same rooms as Vault 666. The maze itself doesn’t appear to make much attempt to tie into the movie, other than feature the serial killer in a couple of scenes (the latter half is more successful at drawing a scene of a killer in a haunted attraction). But little about the set design suggests a haunted theme park. This exact maze could have been titled by another name and felt the same. The maze ends better than it begins, with several designed scare moments. I suspect that Hell Fest was victim to either notable budget constraints or scheduling delays that precluded the ability to properly construct a new maze. It’s a shame, because it doesn’t really help promote the movie, other than provide name recognition, and it doesn’t truly function as a new attraction. Here too, a complete lack of a soundtrack plagues the experience, missing out on a chance to connect audiences to the upcoming film. If Sewer of Souls was an absolute joy of a surprise in all the best ways, Hell Fest was pretty much the opposite. 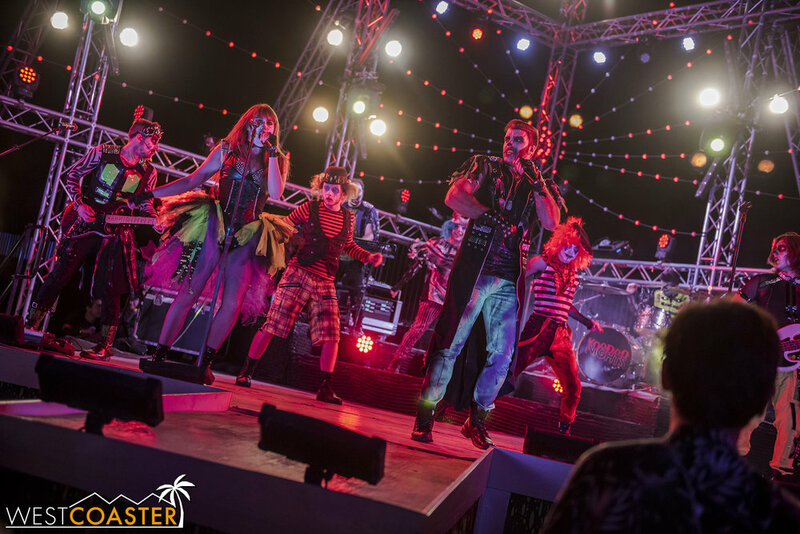 On the show front, Fright Fest returns two performances that guests will recognize from prior years. 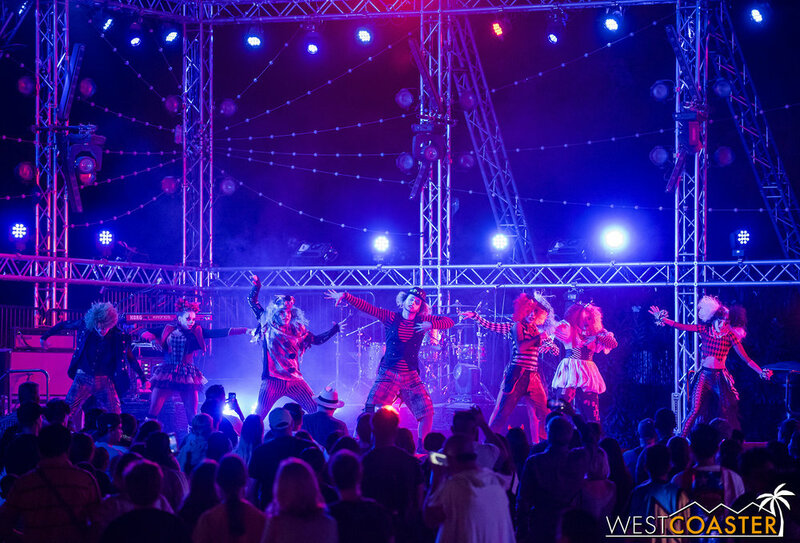 The big name is Voodoo Nights, a mix of dance performances, a cover band, and DJ work occurring at the Full Throttle stage throughout the night. This is a high energy club experience, in effect, and it was pretty popular the several times we passed by. 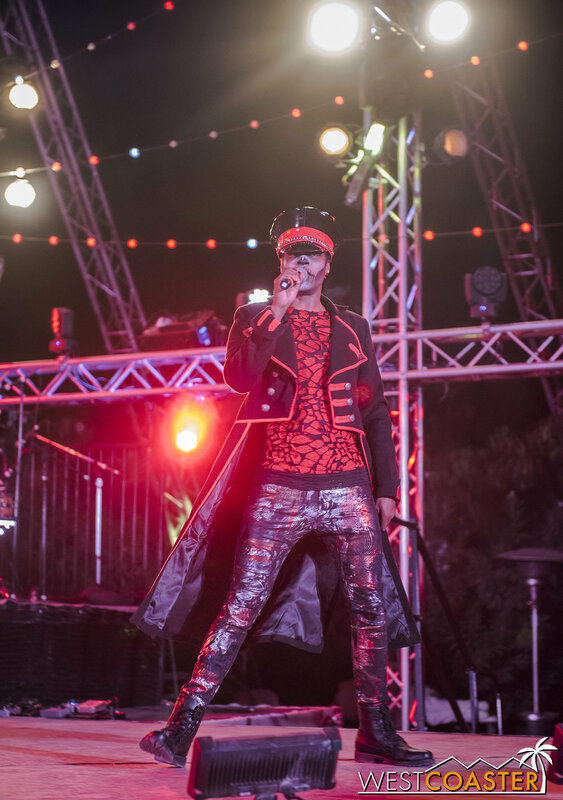 There is also a hypnotist show that takes place on Saturday nights only. We were not able to make it to that, unfortunately. 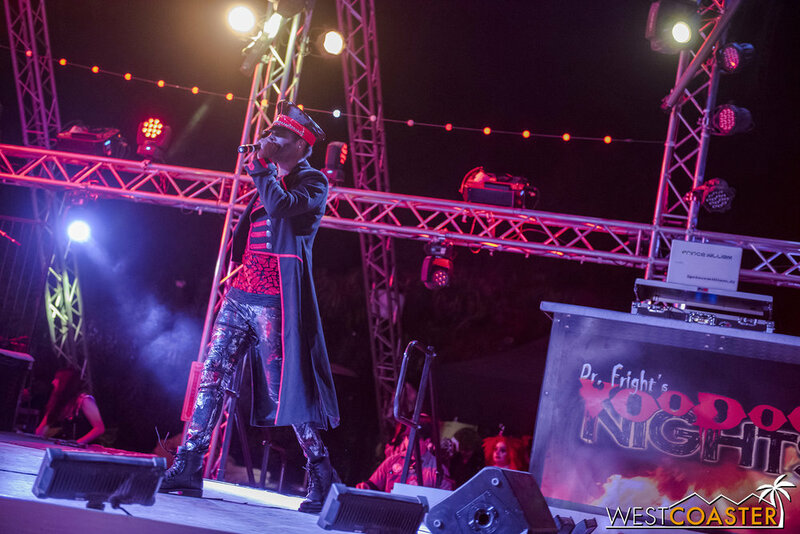 The Voodoo Nights band entertains guests with covers of current and classic pop hits. A DJ spins tracks during down periods. 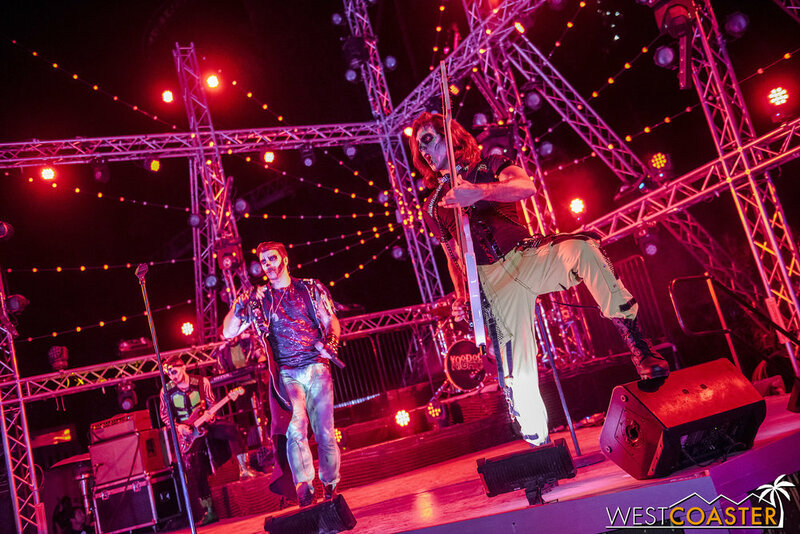 The Voodoo Doll dancers provide some rhythmic entertainment during the other segment of the rotating show. 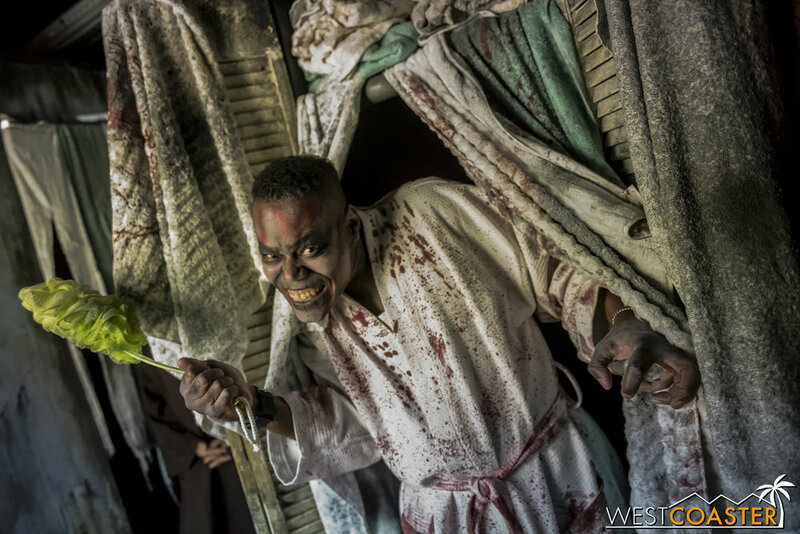 Fright Fest runs Fridays through Sundays from now until October 28. 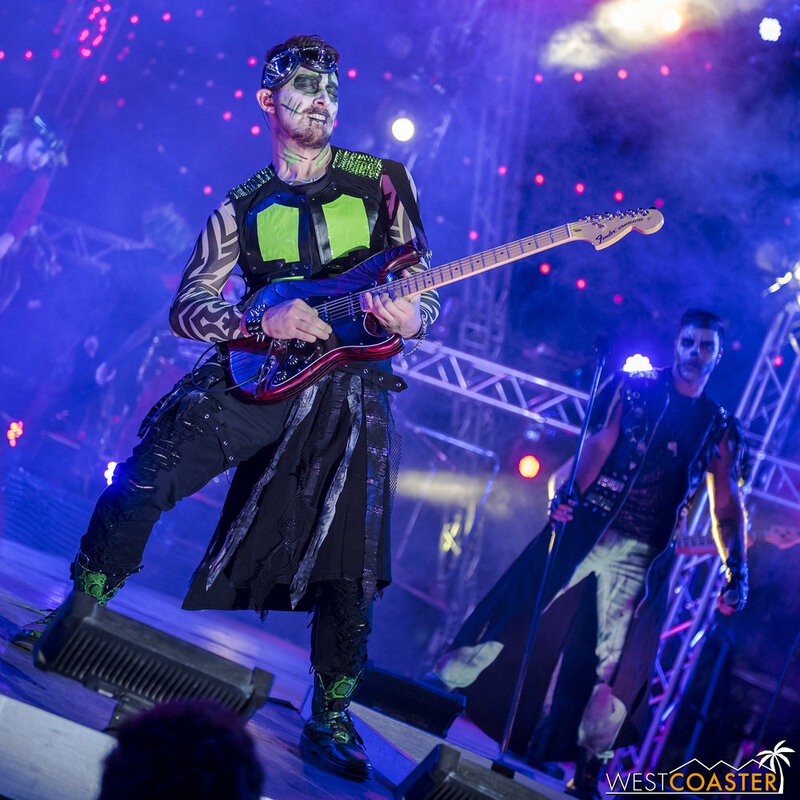 Tickets and additional information can be found on Magic Mountain’s web site. If you’ve never gone before, I do recommend visiting. Through the purchase of a maze wristband, mazes are an add-on to regular park admission, which also provides access to the Fright Fest hours. 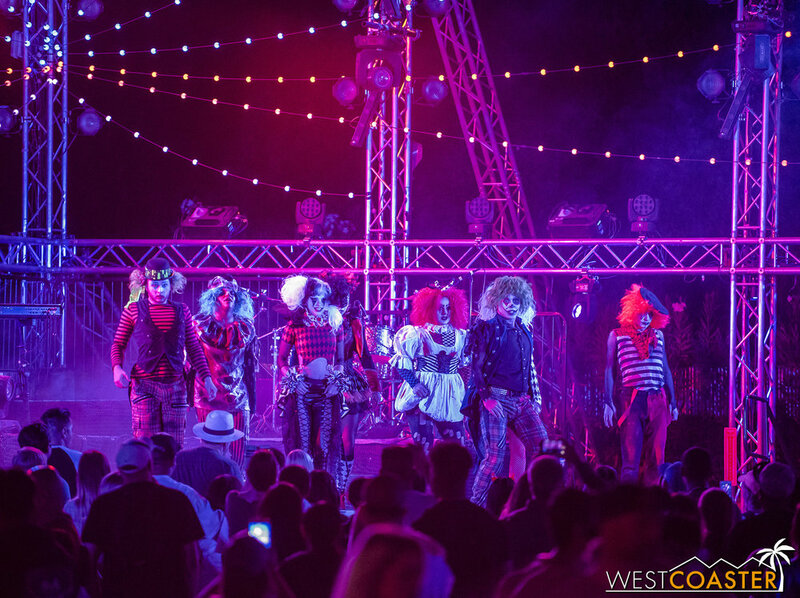 Unlike the other theme parks around Southern California, Magic Mountain’s Halloween event is not a separate ticket. There is also an express version of the maze wristband that I do recommend, because the regular lines can build up in the middle of the evening. It’s not that expensive either, unlike front of line privileges at some other haunted attractions. As far as cost goes, Magic Mountain definitely provides a less expensive haunt (lower case 'h’) experience. That wraps up the first half of our 2018 Six Flags Magic Mountain Fright Fest review. Part 2, covering the scare zones, comes tomorrow. And although the maze critiques progressed in descending order and ended on a bit of a downer, as a whole, I think Fright Fest is definitely still on an upward trajectory. The park knows that it still has room to catch up to the very highest tier that Universal and Knott’s (and even Dark Harbor) have paved, but Magic Mountain has made leaps and bounds of improvement over the maze line-up it used to trot out. In Sewer of Souls, Red’s Revenge, and Aftermath 2, I think Fright Fest has three mazes that are competitive with those at the park’s rival haunted events. Willoughby’s is solid too, though very dated. It’s the last two that feel more reminiscent of old Fright Fest than new. Still, there are good steps being made. Remember that even a place like Knott’s was at a state less than a decade ago where only two or three mazes stood out, another few were middling, and a couple were noticeably poor in comparison. So I think Fright Fest will get there, with time, as Six Flags continues to invest and make a push to improve the event’s offerings. No need to burn it with fire. Fright Fest has definitely become a respectable haunt over the past few years!